Kevin Neveu, chief executive officer of the oilfield-service company Precision Drilling Corp.
Oil prices slid more than 6 percent on Friday to the lowest levels in more than a year. New York futures closed at $50.42, down almost $26 a barrel since early October, and London closed at $58.80, down more than $27. The reasons for the plunge, which some observers are calling excessive, are well known. Inventories continue to build as US shale oil production increases; there are signs of a weaker global economy ahead; Washington has granted six-month waivers for Iranian oil importers; Moscow is not interested in cutting production; and there are doubts that the Saudis will make a significant cut in production while under pressure from President Trump to keep up production. Trump’s support for Crown Prince bin Salman in the wake of the killing of journalist Jamal Khashoggi is likely to complicate decision-making in Riyadh, to say the least. Saudi Arabia, Moscow, and the OPEC members are considering a compromise plan to cut production that would retain official output targets, first set in 2016, but would imply a quiet production pullback because Saudi Arabia is overproducing by nearly 1 million b/d. While the Saudis could cut a million b/d on their own, a cut of this size combined with the lower oil prices would be a significant blow to their budget and force a dip into their monetary reserves again. With Moscow and Baghdad both talking about increased production next year, the Saudis have a difficult path ahead. Many observers remain skeptical that the OPEC meeting in Vienna on Dec. 6 will be able to cut oil supplies by enough to push prices significantly higher. There seems to be general agreement that ever-increasing US shale oil production— total US oil production has nearly doubled since the start of 2012—has increased concerns about a global glut of crude. Concerns are rising about what the $27 a barrel price drop will do to drilling budgets for 2019. As recently as September, North American oil producers had been increasing spending to take advantage of this year’s higher prices. Now with the revenue per barrel down some 27 percent, and even more due to logistical difficulties in the Permian and Canada, there are concerns about the 2019 drilling budgets and the profitability of the shale oil industry. Drillers that were not making money at $75 a barrel are not making money at $50. Rising interest rates are also leading to the the realization by investors and lenders that it may be a long time and much higher prices before shale oil drilling becomes generally profitable. OPEC: Next week’s OPEC meeting in Vienna has the potential of being a memorable one. It seems likely that there will be a formal agreement that will link Moscow and its oil-producing allies to OPEC. This agreement could morph into a situation where the Saudis (and a few allies) and the Russians (and their former Soviet partners) together call the shots no matter what the interests of the other OPEC states. An OPEC/non-OPEC monitoring committee co-chaired by Saudi energy minister Khalid al-Falih on November 11 hinted that the coalition would consider production cuts of up to 1.4 million b/d to shore up prices. But that was before President Trump this week voiced his political support for Saudi Arabia, repeatedly calling out the kingdom to keep oil prices low, as it deals with the global fallout from the murder of dissident and journalist Jamal Khashoggi. Many analysts believe that OPEC will find it difficult to go against the wishes of the US administration and make the necessary production cuts. In a related issue, the US Department of Justice is reviewing antitrust legislation aimed at reining in OPEC’s power over oil markets. The House Judiciary Committee in June approved the “No Oil Producing and Exporting Cartels Act,” or NOPEC bill, which would give the attorney general the authority to file a suit against OPEC for trying to control oil production or to affect crude prices. This would amend the Sherman Antitrust Act of 1890; the law used to break up Rockefeller’s Standard Oil. A similar Senate bill hasn’t seen any action yet. Although past presidents have threatened to use their veto power to prevent similar measures from becoming law, President Trump has repeatedly attacked the cartel over high prices. US Shale Oil Production: More than a dozen top U.S. energy companies have pledged $100 million toward easing stresses on health care, education and civic infrastructure from the shale oil and gas boom in West Texas and New Mexico. Chevron, EOG Resources, Exxon Mobil and Royal Dutch Shell are among 17 companies backing the Permian Strategic Partnership. The group seeks to address labor and housing shortages, overtaxed health care, and traffic congestion caused by rapidly increasing drilling in the Permian Basin. The Permian continues to be the most desired area for shale oil drillers, but competition for the most productive regions has intensified, driving land and drilling costs significantly higher. Now some independent and smaller firms are looking to gain access to drilling rights outside of the Permian because this year’s higher oil prices have made other U.S. shale plays profitable – at least until recently. North Dakota recently reported that its September production hit a new record and that while drilling had been confined mostly to the four most productive counties, it was now expanding in less productive areas of the Bakken. Three-mile-long laterals were now being drilled to get the initial production up to that of the more productive areas. As the report on September production came six weeks into the recent price drop, North Dakota officials already knew that increasing production from the Bakken, which had been going on since June, was unlikely to continue in a period of lower prices and warned of trouble ahead. Climate: A major scientific report issued by 13 federal agencies last week presents the starkest warnings to date of the consequences of climate change for the United States. The study, which was mandated by Congress and made public reluctantly by the White House, is notable not only for the precision of its calculations and bluntness of its conclusions but also because its findings are directly at odds with President Trump’s agenda of environmental deregulation. The 1,656-page assessment lays out the devastating effects of a changing climate on the economy, health, and environment, including record wildfires in California, crop failures in the Midwest and crumbling infrastructure in the South. The report finds that US exports and supply chains could be disrupted, agricultural yields could fall to 1980s levels by midcentury, and the fire season could spread to the Southeast. According to the official figures of the International Energy Agency, the current combined share of solar photovoltaic energy and solar thermal energy, wind and tidal energy, and geothermal energy in global energy production is 1.5 percent. Other non-fossil fuels such as nuclear, hydro, and biofuels bring the non-carbon emitting energy sources to about 14 percent, but these sources of energy are unlikely to grow very much in the coming decades. Iran: The status of Tehran’s oil exports remains uncertain after the announcement that Washington was granting partial six-month waivers to regular importers of Iranian oil. Iran’s oil exports in November appear to have dropped by several hundred thousand barrels per day compared to October, as many Iranian customers had not made November purchases amid uncertainty whether they would get US waivers. China is set to continue importing robust volumes of Iranian crude at least through the end of this year thanks to the US waivers. Although there is no clarity on volumes on Iranian crude that Chinese buyers can ship in under the US waiver, sources said that the waiver would allow some of the key Chinese buyers, such as Sinopec, to honor term contracts they have for Iranian supplies. The waivers and the likelihood that Iran’s exports will not drop as much as expected has been one factor contributing to the sharp oil price drop in the last two months. Iraq: After Kurdistan’s independence referendum passed overwhelmingly last year, Baghdad seized the Kirkuk oil fields and stopped exporting some 300,000 b/d of oil through the Kurds’ pipeline to Turkey. After a year of negotiations, an agreement was reached to resume exporting Kirkuk oil through Kurdistan. While the initial flow to the north is only some 50,000-60,000 b/d, this could soon be increased to 400,000 b/d. This is a significant quantity of oil and is yet another factor in an emerging oil glut and lower prices. The US granted Baghdad a 45-day exemption from Iranian sanctions, allowing it to keep importing the natural gas used to generate electricity. It is not clear what is to happen after the 45 days, as it will take Iraq much longer to find another source of supply. A reduction in the electricity supply could easily lead to a destabilization of the country. Saudi Arabia: A combination of the Khashoggi affair and the rapid drop in global oil prices is causing major problems for the Saudi government. For now, President Trump seems ready to ignore any involvement of the crown prince in the assassination plot in return for a promise to keep oil prices low by pumping more oil. According to Energy Minister Khalid Al-Falih, Saudi Arabia currently is producing oil in excess of 10.7 million b/d, considerably more than in recent years. The recent $26 a barrel price drop likely will force the Saudis to reduce production as the government is again operating at a deficit. International oil prices have fallen to $58 a barrel, far below the $88-a-barrel level that the International Monetary Fund says Saudi Arabia needs to balance its budget. On Thursday, Khalid al-Falih said that if he sees weak oil demand in January, the kingdom would respond accordingly to cool the global market’s anxiety. Caught between pleasing Washington with policies that won’t lead to price spikes and cutting back the flow of oil to rebalance oversupplied global markets, it appears that OPEC and the Saudis will announce that they are cutting back to the official 2016 targets which imply a cut of nearly 1 million b/d from current production levels for Riyadh. The cut “would be more discrete,” said an OPEC official, who added the production cut would satisfy the US on oil prices “would be a quid-pro-quo” between the Saudis and Mr. Trump. It also would avoid a confrontation with Russia, which wants to continue increasing production. The situation may become clearer after the OPEC meeting in early December. Saudi Arabian Oil Co had considered issuing up to $40 billion in bonds to help buy 70 percent of Saudi Basic Industries Corp. However, people familiar with the situation say the government is now worried about the level of disclosure required for a bond issue and whether the uncertain outlook for the oil market might damp demand for debt or increase the cost of borrowing. Aramco executives also have raised concerns that the recent diplomatic fallout from the Khashoggi murder might affect investors’ appetite for Saudi debt. Libya: The National Oil Corporation will soon resume the Phase 2 development of the offshore natural gas producing Bahr Essalam field. The second phase of development of the field began in July this year and according to Eni will add 400 million cu ft of natural gas to its daily production of 700 million cu ft. Offshore oil and gas production in Libya these days is a much better bet as it is out of reach of the various insurgent groups that are forever trying to interrupt production. Last week there was news that Libya’s UN-recognized government and the eastern rival government might just be willing to settle their differences and hold elections early next year. While nothing is certain as yet, a settlement between the two government would go a long way towards stabilizing the situation and allowing the country to increase its oil production from the current 1.3 million b/d. Libya probably has the largest oil reserves on the continent, and its oil is relatively easy and cheap to develop if the security situation improves. Crude stockpiles in China rose by 29 million barrels last month from September and are likely to continue up, according to S&P Global Platts calculations. The inventory build was a result of rising imports combined with lower refinery activity, which led to the 416 percent surge in October from September. China’s crude oil imports averaged 9.61 million barrels a day last month, the highest on record. Industrial gas demand in North China is showing signs of a sharp slowdown as small manufacturers shut their doors or buy less gas, unable to cope with a drop-off in export orders and costs related to Beijing’s pollution control measures. The unexpected fall-off in demand from hundreds of small factories from a key industrial region could end up forcing Asian LNG spot prices even lower. One factory manager said he is facing his toughest year in 20 years of business, blaming Beijing’s campaign to switch users from coal to gas – which makes gas prices volatile – falling export orders, and frequent forced shutdowns in response to heavy smog. Russia’s Gazprom will soon complete the bulk of the work for one its most ambitious projects ever that involves building a natural gas pipeline from Siberia to its border with China. The pipeline will ship 38 billion cubic meters annually of natural gas to China for a 30-year period. Chinese buyers have returned to buying US crude oil after halting all imports of US grades in August and September. China bought 15 million barrels and 13 million barrels of US crude in June and July, respectively. Official export data for October is not yet available. The effect that President Trump’s tariffs will have on US LNG exports to China is still unclear. Beijing is the world’s second largest importer of LNG after Japan and has been an important customer for US LNG. This year between January and August, China purchased 1.6 of the 14.9 million tons of US LNG, but September 24th was the start of President Trump’s imposition of tariffs on $200 billion worth of Chinese goods and China’s retaliatory levy of 10 percent on imports of US LNG. Wholesale prices are already near their highest levels in a decade, driven by rising shipping costs, low European gas stocks and Chinese purchases to avoid a recurrence of last winter’s shortages. Energy Minister Novak said last Monday that the country was planning to sign a partnership agreement with the Organization of the Petroleum Exporting Countries (OPEC) and that it would be discussed at OPEC’s Dec. 6th meeting. A formal alliance between Moscow and OPEC, which in reality means with Riyadh, would mark an important change in global oil policies. Although Russia and the Saudis have many different concerns, they are both dependent on their oil and gas exports to keep solvent. This means keeping prices as high as the markets will bear without reducing the demand for oil. Construction of the offshore part of the TurkStream pipeline that will carry Russian gas across the Black Sea to Turkey has been completed, Russian gas producer Gazprom said on Monday. TurkStream is part of Moscow’s efforts to bypass Ukraine as a gas transit route to Europe, which imports around a third of its gas needs from Gazprom. Gazprom has stopped natural gas auctions on its electronic sales platform because all the natural gas available until the end of 2018 has already been sold. Gazprom started its Electronic Sales Platform in August for physical natural gas sales to European consumers. Sales in this manner would be in addition to supplies under existing contracts. Sales via the electronic platform began on September 20, and according to Gazprom Export data, no auctions have been held since last Friday, November 16. The global demand for natural gas has been increasing quickly as a more environmentally friendly substitute for coal as city after city become burdened with unbreathable air. The LNG industry is growing rapidly but will have trouble keeping up with demand. As Moscow opens new pipelines to China which cannot produce enough gas to meet demand, an increasing number of shortages are likely to develop. PDVSA has reopened a dock at the country’s main oil terminal of Jose that had been closed for almost three months due to a tanker collision. Dozens of tankers waiting to load Venezuelan oil were diverted to other PDVSA’s terminals since Jose port’s South dock was shut in late August, causing delays in deliveries to customers and cutting export revenue. Venezuela’s crude exports fell to 1.06 million b/d last month and is probably below 1 million today. Talks with shipping firms to set up a second ship-to-ship oil transfer operation off the country’s eastern coast have begun. Earlier this PDVSA year began sea-borne oil transfers off its western coast, to move crude and fuel oil to Asia, after its ports clogged with tankers waiting to load and tanker loads in its Caribbean terminals faced seizure by creditors. Ship to ship transfer of oil at sea is difficult and dangerous. Insurers will only allow certified captains and mooring masters to undertake such operations. R&D plane: MIT researchers have demonstrated that an aircraft with a 5-meter wingspan can sustain steady-level flight using ionic-wind propulsion. The aircraft has no moving parts, does not depend on fossil fuels to fly, and is completely silent. The researchers describe their proof of concept for electroaerodynamic (EAD) airplane propulsion in a paper in the journal Nature. What follows is a review of an English translation of an important book covering the history of the oil age which initially appeared in French three years ago. The English language version was published earlier this month and has been updated to include developments in the world oil industry through the early part of 2018. The review’s author is Jean Laherrère, a noted French geologist-geophysicist who was one of the first to recognize that world oil production will peak in our lifetime. The review incorporates Laherrère’s latest assessment of the global oil situation and prospects for oil in the coming decades. The book is available in hardcover and Kindle editions from Amazon.com. I have spent my professional career as a geologist-geophysicist involved in oil and gas exploration on every continent and have been an active participant in the peak oil debate during the past quarter century (petroleum geologist Colin Campbell and I were instrumental in initiating that debate via our article, “The End of Cheap Oil” published in Scientific American, March 1998). The story of oil is in my blood. I would like to state a few observations that came to mind as I was reading Matthieu Auzanneau’s excellent new book, Oil, Power, and War: A Dark History. Auzanneau reminds us that the story of oil is also the story of the modern industrial era, in which politicians of every stripe have enshrined economic growth as the goal of policy. Every government promises economic growth, without saying where it will come from. Growth is assumed to be GDP growth, and for a long time GDP was supposed to come from capital and labor. But economists Reiner Kummel and Robert Ayres have shown that energy consumption, in particular oil, is the main force behind GDP growth. These economists conclude that our consumer society is based on cheap energy. And the close historic correlation between growth in energy, especially oil, and growth in the global economy supports their conclusion. The “thirty glorious years,” as it is called in France, covered the period 1945-1973—from the end of the Second World War to the first oil shock—when world oil production growth averaged 7.5 percent per year. Compare that to 1.1 percent average growth (excluding extra-heavy oil) for the period 1983-2017, which could be called the “thirty laborious years.” GDP growth has become harder to achieve, and economists now fret over what they call “secular stagnation,” often without any understanding of the underlying shifts in the oil industry. The maintenance of growth has become highly dependent on quantitative easing, low-interest rates, and tax cuts, all of which are problematic over the long run. Auzanneau tells the story of how, since its beginning, the global petroleum industry has been dominated by the United States; his book also recalls and explains the turbulent dynamics resulting from a continuous fight between the oil companies and oil-producing countries—especially between the “seven sisters” oil companies (six American and one British) and the members of OPEC. The United States’ continued dominance of the industry is demonstrated by the fact that world oil is still mainly priced in US dollars per barrel (an antiquated volumetric unit defined as “42 US gallons”). Every energy investor knows the current oil price in dollars per barrel, but few know it in dollars per ton or in rubles per ton. Further, while every non-US country (except Liberia and Myanmar) uses the International Unit System (called SI or the metric system), many oil companies use US units and symbols. For example, Rosneft, a Russian oil company, follows the US custom of using mm or MM for million instead of M (short for “mega-” as used in the world computer business in reference to frequency, as in MHz or megahertz), because Rosneft is listed on the US stock exchanges and is therefore required to follow SEC rules. The US also has the largest number of oil-producing companies with over 18,000 upstream firms (IPAA 2017) against one in Saudi Arabia and three main oil producers in Russia. The power of the US oil industry is somewhat explained by the fact that the United States’ share of historic world oil production is the highest of all countries. US cumulative crude oil production to date represents 16 percent of all oil ever produced (for Russia, the figure is 13 percent; for Saudi Arabia, 11 percent). Of course, the United States’ share of world production has evolved over time. As of 2017, the US was responsible for 13 percent of total world crude oil production, while Russia provided 13 percent and Saudi Arabia 13 percent. Finally, despite generally falling production in the years 1972-2011, the US has seen its production recover in recent years due to light tight oil (LTO) produced by horizontal drilling and hydrofracturing (“fracking”), which I’ll discuss at greater length below. As a result of this resurgence, since roughly 2010, American LTO has been the key factor preventing a stagnation or decline in overall world oil production. Before delving further into the subject of fracking, it’s important to note that there are some big problems with the reliability of oil data. The first problem is that there are several definitions of “oil,” including crude oil; crude oil plus condensate; crude oil plus natural gas liquids; and crude oil plus other liquids, refinery gain, and biofuels. In 2016 the Energy Information Administration (EIA) at the US Department of Energy listed average world oil production as 80.6 million barrels per day (Mb/d) for crude only, and 97.2 Mb/d for all liquids, implying a 20 percent uncertainty when “oil” is not explicitly defined. For US oil production, that uncertainty is even greater. In 2017, US production according to EIA was 9.4 Mb/d for crude, and 13.1 Mb/d for crude plus natural liquids; adding refinery gain (1.1) and biofuels (1.2) we arrive at a figure for all liquids of 15.4 Mb/d, which is 6 Mb/d more than for crude alone! The energy content of oil is variable, but despite the importance of this fact (oil, after all, is used primarily as an energy source and it is the world’s foremost single source of energy), official agencies pay little attention to it. The energy content of LTO, which is often inaccurately called “shale oil,” per volumetric unit is less than that of conventional crude oil; so, as LTO has come to take up a larger proportion of overall US oil production, the overall energy value of the country’s oil production has grown less than its volumetric increase would suggest. The monthly quantity of crude oil produced in the US comes from EIA estimates. These estimates change over time but are finalized two years after the oil was first drilled. That’s because, in Texas, operators can wait two years before reporting precise values, due to a confidentiality clause in the reporting rules. Further, production reports from some other countries are often unreliable (though frequently specified down to four decimal points, despite their discrepancies). OPEC’s monthly oil market report from July 2018 gives OPEC members’ oil production in Table 5-9 based on secondary sources, where Nigeria in 2017 has produced 1.658 Mb/d; whereas in table 5-10, based on direct communication, Nigeria claims to have produced 1.536 Mb/d—or 7.5 percent less. For Venezuela in 2016 the difference between self-reported production and secondary reports was 9 percent. In general, direct communication from OPEC reports higher production values than secondary sources. In effect, this means that OPEC members lie about their production. In sum, everybody in the oil industry is lying, reporting wrong data or no data, except for a few countries like the United Kingdom and Norway that report precise field production and reserves. As a result of these data problems, it is difficult even for energy analysts, much less the general public, to understand current and future trends in the industry. The final chapter of Oil, Power, and War is titled “Winter, Tomorrow?” and describes the arrival of both peak oil (the point when the rate of world oil production reaches its maximum and begins to decline) and the fracking revolution. As noted above, US tight oil has changed everything. Certainly, it served to torpedo the peak oil discussion. When Colin Campbell and I wrote “The End of Cheap Oil” in 1998, the price of West Texas Intermediate-grade crude (WTI) stood at $11 per barrel. The price then declined to $8 per barrel in January 1999; at that time, the title of our article appeared foolish. In 2000 Colin introduced the term “peak oil” and with Kjell Aleklett (of Uppsala University) created the Association for the Study of Peak Oil and Gas, or ASPO. We began organizing ASPO conferences in Europe. Meanwhile, the price of oil rebounded. As oil prices soared, so did interest in peak oil. At the 2007 ASPO conference in Cork, it was decided to allow the creation of national ASPO chapters. Many countries soon created nonprofit organizations to study oil depletion, including Argentina, Australia, Belgium, China, France, Germany, Ireland, Israel, Italy, the Netherlands, New Zealand, Portugal, South Africa, Spain, Sweden, Switzerland, and the US (only ASPO USA had a permanent staff). Colin Campbell issued 100 ASPO monthly newsletters from January 2001 to April 2009, writing in many of them about the geology, historical production, and future prospects of individual oil-producing countries. These country-by-country profiles were collected and republished in his book, The Essence of Oil & Gas Depletion. At the Cork conference, the former US Energy secretary James Schlesinger said, “The debate on peak oil is over; the peakists have won.” Schlesinger repeated his message in October 2010 at the ASPO USA conference in Washington D.C., telling the audience, “The peak oil debate is over.” In fact, the debate was about to shift decidedly against us peakists. The last ASPO international conferences took place in Brussels in 2011 and Vienna in 2012. In 2011, thanks to horizontal drilling and hydrofracturing, US tight oil production had risen to over 1 Mb/d. In 2015, US LTO production rates reached 4.7 Mb/d but declined to a low of 4.1 Mb/d in 2016 due to low oil prices. Production is presently a little over 6 Mb/d. In 2017 Kjell Aleklett retired from the University of Uppsala. By this time ASPO had become inactive in many nations, including the US. Today only ASPO France is active and growing (with three meetings per year and a website that continues to publish new papers). It is clear that ASPO (and the peak oil discussion generally) peaked around 2010 and has been in decline ever since. In 2007, when the notion of peak oil was becoming generally accepted, and the public started to respond with efforts to conserve oil, the sport utility vehicle (SUV) became an object of scorn—at least in some circles. At the time, SUVs represented only 8 percent of car sales in China and 5 percent in France. In 2017, with oil considered plentiful again as a result of the US fracking industry, SUVs represented 42 percent of light vehicle sales in China and 31 percent of those in France. Now many energy commentators argue that oil is abundant and that any decline in world oil production should be interpreted as a peak in demand and not a geology-driven peak in supply. But this interpretation ignores the fact that for each deal where oil is sold, price is dependent on both supply and demand, and the price is often confidential. Commentators are also confused because oil is also sold in futures contracts, which change hands many times. For me, geology is still the key, and the debate on peak demand versus peak supply is mostly wrong-headed. There are only a few countries that have not yet reached their peak of production, namely Brazil, Canada (with its oil sands), Iraq, Kazakhstan, Malaysia, UAE, and Venezuela. In the cases of Saudi Arabia and the US, crude oil may be presently peaking. For the US, natural gas liquids production was 40 percent of crude oil production in 2017, when it was only 33 percent in 2000 and 9 percent in 1950. It is important to check whether “oil” is crude oil or crude plus natural gas liquids because values and trends are quite different. Before being produced, oil has to be found—so exploration is the first chapter of the story. 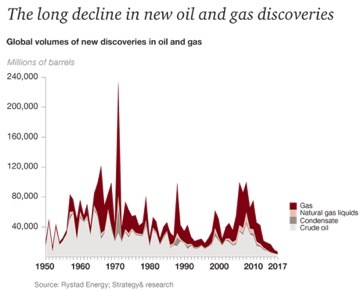 Discovery of oil has been declining since the 1960s. Discoveries in 2017 were the lowest since the 1940s. For this reason alone, the oil industry is in trouble over the long term. US tight oil—the last domino to fall? The big question is when the production of LTO in the US will peak. Within the US, the Permian Basin in Texas will likely turn the tide. As of 2006, that region had already produced up to 32 billion barrels (Gb) of conventional oil; then, from 2007 to 2017, an additional 5.5 Gb of conventional and unconventional oil was extracted. Of the LTO plays in the country, the Permian is currently seeing the highest rate of growth in production and will probably be the last to peak. Soaring US tight oil production was largely responsible for a fall in global oil prices in 2015; with lower prices, LTO production was unprofitable, and drilling was scaled back, which in turn led to a fall in production. But as oil prices have gradually recovered, so have drilling and production. Official forecasts of LTO future production are based on a certain number of wells multiplied by the estimated ultimate recovery per well, without bothering to check whether there is enough room to drill all the wells needed. LTO is often described as a continuous petroleum accumulation covering an entire geological region, when in fact only small parts of the region are economically productive; those parts are typically called the “sweet spots.” In the Bakken and Eagle Ford plays, the sweet spots have been almost completely drilled. The Permian basin, with several sub-basins and many reservoirs, is less drilled. Production during the first month increases when operators drill longer lateral well segments, and when they inject more sand (a record amount of 22,000 tons was injected in one well in Louisiana) to prop open the rock fractures. However, with these technological “improvements” it appears that the ultimate recovery per well may decrease and that new wells diminish the production from surrounding wells. Reserves estimates for LTO that are made using the same approach as for conventional oil are completely unreliable. The best approach for forecasting future production is the extrapolation of past production (called Hubbert linearization). For Eagle Ford, the trend can be extrapolated toward an ultimate quantity of 3 Gb. This is more than double the 2016 proven remaining reserves plus cumulative production. Extrapolation of past US LTO production leads me to guess that LTO will peak again soon and decline definitively so that production will be negligible by 2040, though this is admittedly at odds with what some other analysts are saying. I am even more pessimistic about LTO production outside the US. In June 2013 the EIA published a report written by the consulting firm ARI, “Technically Recoverable Shale Oil and Shale Gas Resources: An Assessment of 137 Shale Formations in 41 Countries Outside the United States.” The authors estimated there to be 287 billion barrels of global shale oil “unproved resources,” of which 75 Gb is in Russia, 58 Gb in the US, 32 Gb in China, 27 Gb in Argentina, 26 Gb in Libya, 18 Gb in Australia, 13 Gb in Venezuela, 13.1 Gb in Mexico, 4.7 Gb in France, and 3.3 Gb in Poland. From the perspective of a few years later it is obvious that this report was mainly wishful thinking. Russia has the world’s largest shale play with the Bazhenov. In the 1960s the government set off three underground nuclear explosions there to free oil from the tight rocks in which it is embedded; this extreme intervention met with no success: the reservoir was vitrified, and natural gas that was subsequently extracted was radioactive. More recently, Gazprom has launched a Bazhenov fracking project, hoping for commercial oil production in 2025. One has to wonder: why is this taking so long, if the existence of the oil has been known for decades? It appears that Gazprom has not yet found the sweet spots (if they exist)! Shale oil exploration in Poland was a failure, and the operators left. In Argentina the Vaca Muerta is mainly a shale gas play; China has drilled hundreds of wells there, but production levels are well below target (one trillion cubic feet by 2020). This is also the case for the UK, where Cuadrilla has drilled two shale gas wells in England but has not yet fracked them (the practice is now forbidden in Scotland, Wales, and Northern Ireland). Approval for fracking the Cuadrilla wells was finally granted on 24 July 2018. The main problem with LTO globally is that the US cannot be taken as an example for the rest of the world. This is first because the US is the only country where underground mineral rights (including oil) often belong to owners of the land. Landowners thus receive a huge bonus for signing a deal with an oil operator, plus royalties on the production. LTO drilling, fracking, and producing causes many nuisances (including several hundred truck trips for one fracking job) as well as pollution. Landowners accept these nuisances in the US, but in the rest of the world, landowners have only the nuisances and no money; it is why the NIMBY (not in my backyard) reaction is so strong elsewhere. Many places, including France and even the US state of New York, have forbidden shale oil and shale gas activities. It appears that US LTO production will decline soon while significant production of tight oil in the rest of the world has not yet started—and may never really get off the ground. Meanwhile, more nations are reaching their peaks and going into decline: Algeria 2015, Angola 2016, Australia 2000, Azerbaijan 2009, Canada crude oil 2014, China 2015, Ecuador 2014, Equatorial Guinea 2005, Indonesia 2016, Mexico 2013, Netherlands 1987, Oman 2016. Only Brazil, Canadian oil sands, Iraq, Kazakhstan, UAE, and Venezuela’s Orinoco have not yet reached a peak. Many countries will decline at an annual rate of 5 percent, as Algeria has done since 2015, Australia since 2000, and the Netherlands since 1987. 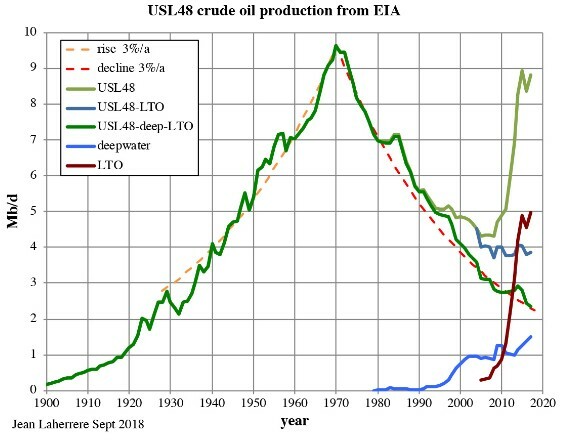 It is likely that in the coming years world oil production will decline (at around 5 percent per year) and that LTO will decline more sharply. This will come as a shock because it is contrary to the official forecasts, which see oil production rising to 2040. Nature is complex and human behavior is irrational; only the past explains the future. Matthieu Auzanneau’s book, Oil, Power, and War: A Dark History, helps us understand the oil industry’s past, which in turn helps us envision the future of not only petroleum but also the global industrial economy. Jean Laherrère is an exploration geologist-geophysicist. He is the co-founder and an active member of the Association for the Study of Peak Oil and Gas, is President of ASPO France, and continues to contribute detailed analyses and projections of the future of world energy production.